While third wife Judith insists Ruy is a "cheating liar" due to his relationship with Maria Ryan, which Rudy denies existed or occurred after their separation, Rudy is not deterred. In fact, Maria Ryan is so last week. 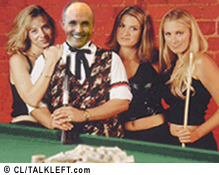 This week Rudy is pursuing yet another romance, with Jennifer LeBlanc, a Louisiana Republican fundraiser and former financial chair of Rudy's 2008 campaign. She is a widow, her husband died in a plane crash. At the time of her death, she and her husband were under criminal investigation. Neither were charged. LeBlanc was the Louisiana finance chair for Giuliani's 2008 presidential campaign. She is a partner at LeBlanc & Associates, where she and her partner provide fundraising and consulting advice to clients in the state as well as to some prominent Louisiana officeholders in D.C.
Rudy Giuliani joined a new law firm, along with former AUSA Mark Mukasey (son of former AG Michael Mukasey.) They are going to head up a new cyber-security section of the firm. They are leaving a law firm in Texas to do so. Miami-founded global law firm Greenberg Traurig LLP announced Tuesday that Giuliani and Mukasey were joining the firm as global chair of the firm’s Cybersecurity and Crisis Management Practice and senior advisor to the firm’s executive chairman, and global co-chair of the firm’s White Collar Defense Practice, respectively. Rudy Giuliani spoke at a private fundraiser last night. He said President Obama does not love America or Americans. Rudy Giuliani today said Joe Biden is "too unbalanced" to be step into the role of President should that become necessary. "I don't think he's nuts. I'm just saying I wonder if he's got the kind of balance - probably what I should have said is the balance to be president of the United States," Giuliani said. "This guy is like one gaffe after another, and he's a joke on late-night television." Earlier this week he said Biden isn't too bright. He was referring to Biden's comment on Tuesday, when speaking to a predominantly African American group, that "Mitt Romney's regulatory policies would "put y'all back in chains." 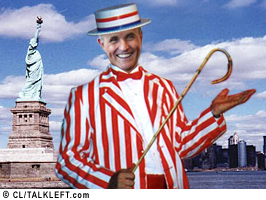 LARRY KUDLOW: " Will you take a look at 2012, there are lots of rumors in New York City?" 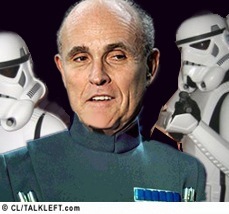 RUDY GIULIANI: "I will take a look at 2012. It's really a question of, can I play a useful role? Would I have a chance of getting the nomination? Those are things that I'll have to evaluate as the year goes along. LARRY KUDLOW: "But the door is open, that's what I'm hearing from you tonight?" 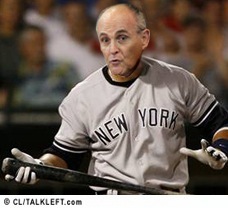 RUDY GIULIANI: "Yes, yes, Absolutely Larry." Rudy Giuluiani is up to his old tricks. Now he's touting federal anti-gang task force legislation. Senate Approves $1 Billion for "Gang Fear and Pandering Act"
Rudy Giuliani's daughter, Caroline Giuliani, a 20 year old Harvard student, was arrested Wednesday afternoon for shoplifting $100 of cosmetics from Sephora on the Upper East Side of New York, near her mother's apartment. The store says when it learned who she was, it tried to call of the cops and told them it didn't want to press charges. The cops said it was too late. I feel like I just got a Christmas present. Rudy Giuliani will announce tomorrow he's not going to run for either NY Governor or Senator. Smart choice, we've had our fill of Rudy, but it's good to hear it from the horse's mouth. He allowed a tight coterie of New York aides, none with national political experience, to run much of his campaign. ....He accumulated a fat war chest — he had $16.6 million on hand at the end of September, more than Mitt Romney ($9.5 million) or Senator John McCain ($3.2 million) — but spent vast sums on direct mail instead of building strong organizations on the ground in South Carolina and New Hampshire. Rudy Giuliani's in trouble in Florida. McCain and Romney are likely to beat him. The latest polls show him battling Mike Huckabee for third place. The LA Times reports on a conversation Rudy had with reporters on his campaign plane Monday. He hinted he would be dropping out if he doesn't win Florida. In a meeting in the back of his chartered plane en route to St. Petersburg, Fla., a short while ago, the onetime, longtime GOP front-runner told a small group of reporters, including The Times' Louise Roug: "The winner of Florida will win the nomination." Other papers are predicting doom and gloom for Rudy in Florida tomorrow. I'm keeping my fingers crossed they are correct. On the Republican side, the New York Times endorses John McCain. That's not a story. The story is why it says it doesn't support Giuliani. It says the man who cleaned up New York and stood tall on 9/11 is not the man running for President. Just in case the fork isn't deep enough into Rudy Giuliani's presidential aspirations, the New York Times helps out a bit.